when we tend to see trucks, the beasts of burden on our roads, as more of a burden than anything else. When they slow down traffic in the freeway fast lane, or block the off-ramps leading to service stations, we see them as more of a curse than a blessing. And as if that were not enough, road freight will increase by another 50 percent by 2040. What can we do to minimize its impact on the environment, people, and the road network? This is one of the most pressing issues of traffic policy. Bosch has some technical solutions, and not just under the hood, but also on the internet. With our hardware and software, we are increasing trucks’ utility. We want them to be beasts of burden, but not a burden for others. The first is climate action. 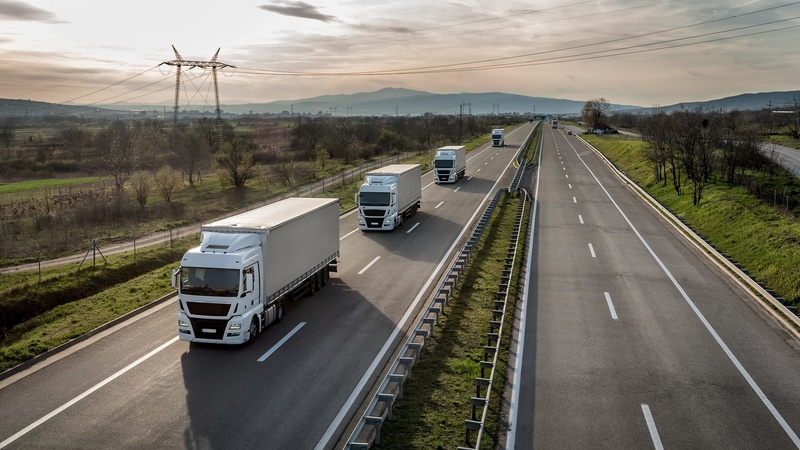 The European Union has announced its first ever CO2 standards for trucks. Regardless of the powertrain technology used, Bosch systems help improve new trucks’ carbon footprint. The second is clean air. Emissions standards for trucks are becoming tighter – worldwide. In 2020, for example, India will leapfrog from Euro 4 to Euro 6. In the United States, emissions are to be measured in real driving conditions, like in Europe. And the emissions limits will be significantly lower. Bosch offers truck manufacturers the solutions they need to satisfy these ecological demands. Third, urbanization. Today, half the global population lives in cities. By 2050, the share will be two-thirds. Road freight will take on a dual role as a result. While heavy trucks will tend to deliver goods to depots on city outskirts, the final mile will be the job of light trucks and vans. Logistics needs to be reimagined, especially in conurbations. And Bosch has solutions for this new-look urban freight transport, including cargo scooters and cargo bicycles. Fourth, online commerce. In Germany alone, the number of packages delivered topped three billion for the first time in 2017, and market studies expect the figure to reach 3.8 billion by 2020. This development is being driven by the increasing number of orders over the internet. But it is the internet, or rather the internet of things, that is helping Bosch to make deliveries significantly more efficient. Fifth, accident prevention. Trucks are involved in one in ten accidents resulting in personal injury. And when trucks are involved in accidents, the risk of fatalities is twice as high as when only passenger cars are involved. This is reason enough to use Bosch driver assistance systems to make truckers’ lives easier and our roads safer. Sixth, economic considerations, or more specifically cost pressure on logistics companies. Fuel accounts for one-third of trucks’ operating costs, and drivers for roughly another third. Even now, there are 50,000 too few truckers in the United States, and that figure is likely to triple within ten years. There are signs that this lack of drivers will also affect Europe. Bosch’s answer to this is to teach trucks to drive – this will prevent accidents, and the fuel savings will reduce CO2 emissions. What benefits logistics companies will also benefit people and the environment. It’s a win-win situation. Beyond the question of costs, therefore, the major issues of mobility also concern the commercial-vehicle and logistics industries. The road freight of the future should ideally be as free of emissions, accidents, and stress as possible. To achieve this, we have to increasingly electrify, automate, and connect it. It is not only in passenger cars that we are taking this development path, but also in road freight, with all its peculiar characteristics. We are one of the world’s leading IoT providers, as well as one of the biggest suppliers in the commercial-vehicle industry – few other companies can combine logistics services and truck technology the way we can. For the modernization of freight traffic, Bosch can bring both economic and technological strength to the table. This year, our Mobility Solutions business sector is expected to increase its sales from day-to-day business by four percent, and will thus continue to grow twice as fast as automobile production. 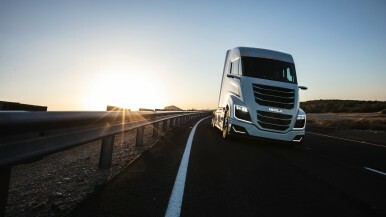 It generates every fourth euro of its sales revenue from technology for commercial vehicles, from vans to mega-trucks. Our business with solutions for trucks and off-highway vehicles is growing especially rapidly. Like last year, growth will be between seven and eight percent. Beyond the current year, we will be continuing our growth trajectory by investing in innovations. 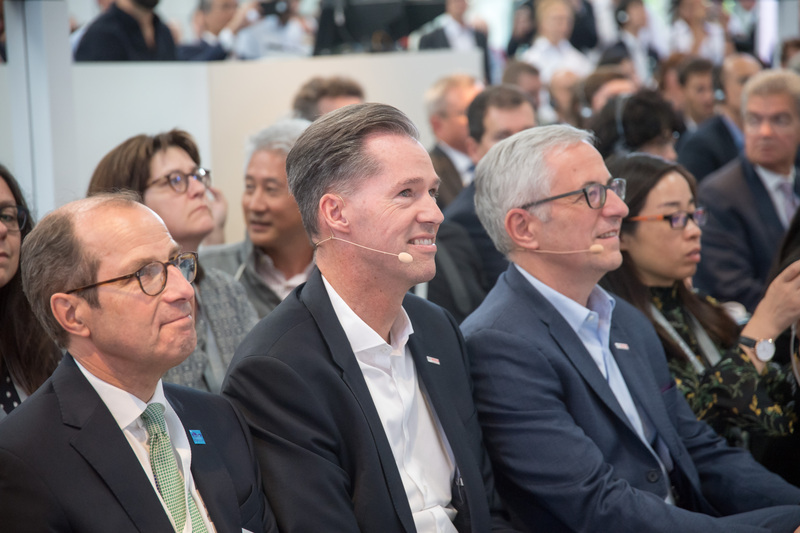 By the end of the year, Bosch will have over 54,500 R&D associates working on mobility solutions – 5,000 more than at the beginning of the year. This is also the team that will create new solutions for transport and logistics. For example, 2,600 engineers alone are working on the truck powertrain of the future. What will this powertrain be? We can imagine a number of alternatives, but are also deliberately continuing to develop diesel technology. Given that 80 to 90 percent of all trucks will be diesel-powered in 2025, this is not least a matter of necessity. Bosch engineers will play their part in helping diesel-powered trucks meet emissions and consumption standards worldwide. It’s a question of combating global warming and protecting the environment – as we already said, these are the logistics industry’s top two challenges. Every milligram of reduced emissions counts, and every percentage-point reduction in fuel consumption means an average 700 euro reduction in annual operating costs for a long-distance truck. How do we want to go about this? For us, reducing fuel consumption and CO2 emissions means increasing the efficiency of injection systems. And when it comes to reducing NOx emissions, one of our solutions is the same active management of exhaust-gas temperature we have applied in passenger cars. For us, this is both a technological challenge and a business opportunity. By the start of the next decade, our global business with exhaust-gas treatment systems will have doubled from its 2016 level. And unit sales of our common-rail injection systems grew by one-third in 2017 alone, and even faster in China. In the years ahead, these sales will stabilize on a high level. All this clearly shows that environmental protection is both a challenge and a boost for our truck-diesel business. 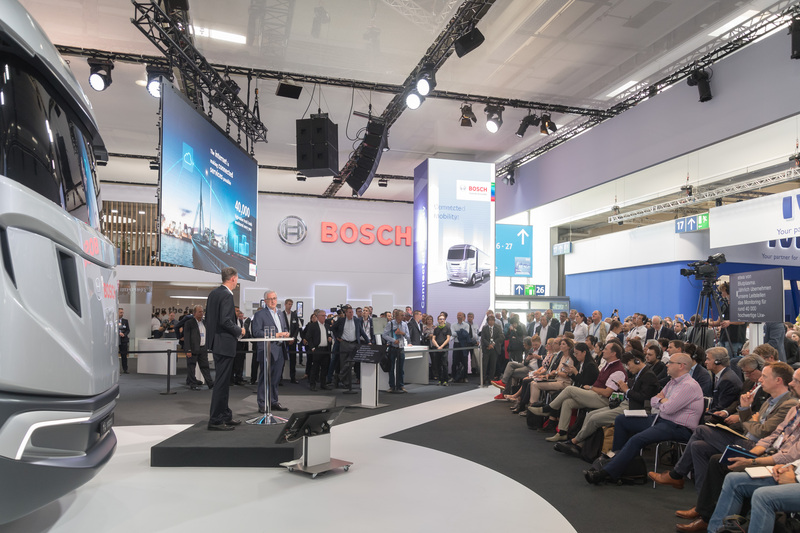 Nonetheless, there will be a growth in electromobility in freight traffic over the course of the next decade, and Bosch will be involved. By 2030, every fourth new commercial vehicle worldwide – nearly every third in China – will be electrically driven. Initially, these vehicles will mainly be urban buses and delivery vans. This is a field in which we scored business success early on: our powertrain components are to be found in Europe’s largest electric vehicle fleet, the German Post Office’s StreetScooters. It is our objective to be the global market leader for electromobility as well. To achieve it, we offer a wide portfolio for commercial-vehicle electrification – from bicycles, as the smallest delivery vehicles, all the way to 40-ton trucks. The portfolio starts with our 36-volt powertrains for cargo bikes that can weave flexibly through urban traffic. Our e-bike business alone already supplies them to four cargo-bike manufacturers. And in 2019, our 48-volt powertrain system will debut in an e-trike for mail and package deliveries. Here, we make use of a modular system, which means that it takes a maximum of 18 months from the awarding of a contract to start of production. Next in line is our e-axle for vans, which goes into production in 2019. Easy to integrate, this system significantly cuts development times for both established automakers and new market entrants. With this system as well, we are giving urban delivery traffic a new electric look. Indeed, we can even electrify today’s semitrailers. Here in Hannover, we are showcasing an electrified trailer axle that can be integrated into existing truck trailers. During braking, the axle recuperates energy and feeds it back into the trailer power units. In a refrigerated trailer, this saves nearly 10,000 euros a year. This money-saving electromobility feature can also be retrofitted. Finally, the ultimate question to be solved is the electrification of heavy tractor units. For medium-range trucks, we are developing battery-electrical powertrains. But how can heavy, long-haul delivery trucks be electrified? A battery would be too heavy and too expensive, and its range too short – the cost-driven freight transportation business has long regarded trucks that drive electrically over long distances as technically and economically unfeasible. Our solution is the fuel cell. Let’s compare the figures. A 40-ton truck capable of driving long distances electrically would have to have nearly ten tons of state-of-the-art batteries on board. A hydrogen tank for a fuel cell would weigh one-tenth of that. Bosch is using two alliances to take up this technology. The first is with the U.S. start-up Nikola Motors, which wants not only to build the necessary vehicles but also to establish a network of hydrogen filling stations. The second is with the Chinese engine manufacturer Weichai Power. Its prospects are good, not least because one million fuel-cell vehicles are expected to be driving on China’s roads by 2030. Worldwide, we are making new energy available for trucks. For many years to come, the development of commercial-vehicle powertrains will involve a number of disciplines. We would be well advised to approach their electrification with a technologically open mind. And let’s not forget that we also need to tackle synfuels, where alternative fuels are produced using electricity from renewables. Nobody who wants to give heavy trucks a secure future can afford to rule out this option. 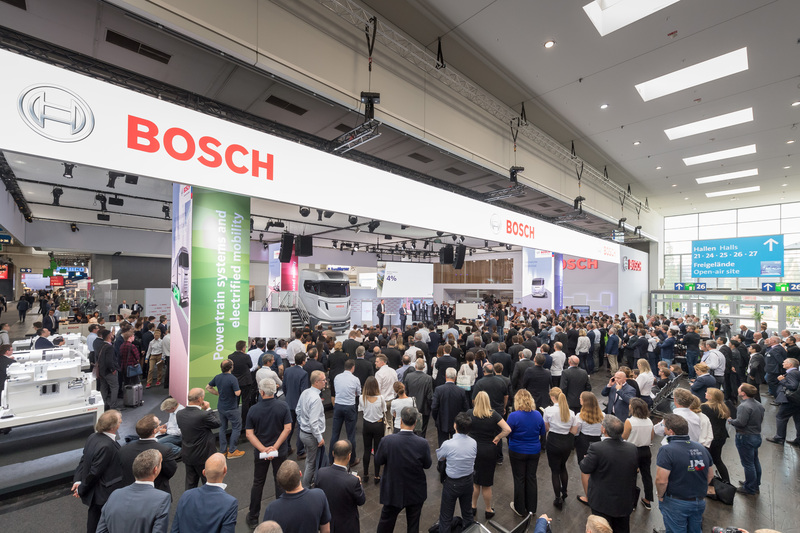 Bosch is initially focusing automated truck development on the U.S.
Electrification is one major growth area in commercial-vehicle technology. Automation is another. In both areas, the signs are set for double-digit market growth over the next decade. Driver assistance systems are a stepping stone on the road to automation. They are crucially important for accident prevention, one of the six main points outlined at the start of our talk. Truck turn assistants, for example, help prevent trucks injuring pedestrians and cyclists. Bosch supplies the necessary radar sensors. Not least, we can interface assistance and steering systems. Our new generation of electronically controlled steering systems, for example, supports lane-keeping functions and automation. It is on show in a number of trucks at this year’s IAA. 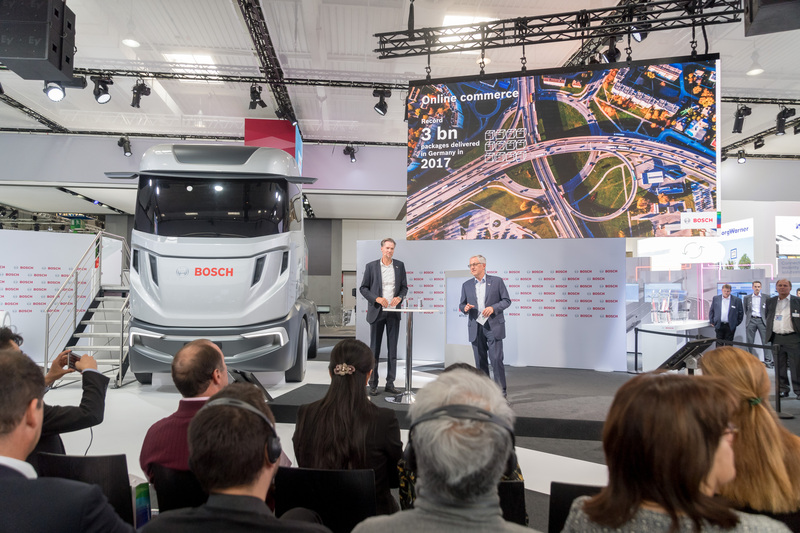 As we move toward automated driving over the next five years, demand for smart steering systems in heavy trucks will double annually, and Bosch will lead the way. 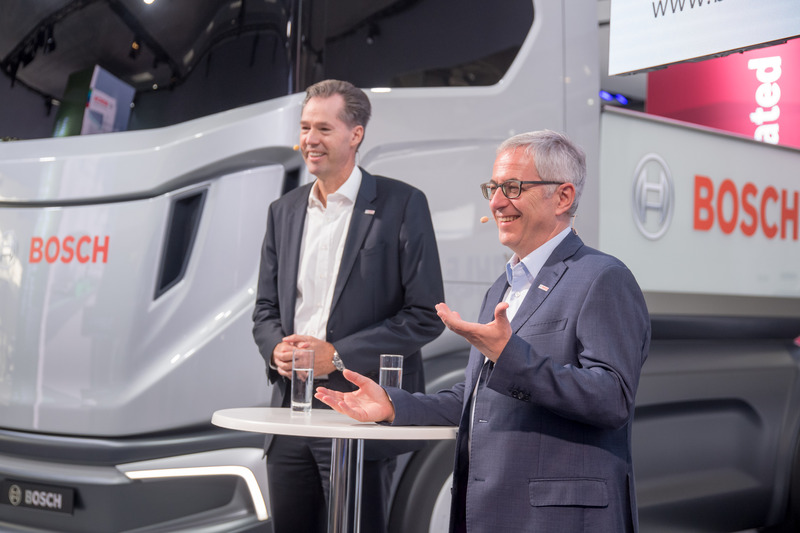 In the United States, Bosch sees huge potential for automation in trucks. It is there that the lack of truckers is greatest, and there that every tenth truck sticks to the same highway routes. First of all, let’s consider what we call “hub-to-hub” automation. By this we mean driverless trucks that shuttle continuously back and forth between two or three depots. This saves labor costs, increases transport volumes, shortens the payback time for investments in vehicles, and provides security – solving several of the industry’s problems in one fell swoop. Even if automation like this is worthwhile, the technical challenges are considerable, whether in terms of computing power, which would have to increase 1,000-fold in a 40-ton truck, or whether in terms of the control center, which would have to resemble air traffic control. Nonetheless, the result could be an unprecedented services business. One other logical development is platooning, or trucks driving in automated fashion in each other’s wind shadow. This saves not only labor costs, but also fuel. However, it also means that legislation, technology, and infrastructure have to satisfy stricter requirements. Bosch is involved in major research projects in the field. And we are developing the telematics components needed for data exchange among platooning trucks. The first prototypes will be tested starting in 2019. We could well see car-to-car communication in trucks before we see it in passenger cars, since platooning is clearly an application that makes economic sense. Where’s the container, where are the goods? Especially in trucks, connected driving is more than just an essential requirement for automated driving. The internet offers the possibility of a new efficiency for transport systems, and of relief for our congested roads as well as for logistics companies. It’s our job to exploit this potential – indeed, this was one of the issues we outlined at the start of our presentation. When it comes to the logistics of the future, Bosch can contribute twofold technical expertise. On the one hand, its broad knowledge of the commercial-vehicle domain, and on the other its profound IoT expertise. 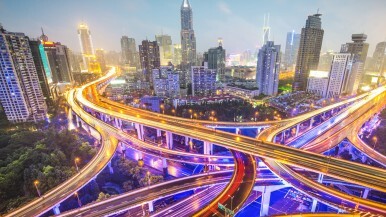 These two factors allow us to offer digitally connected logistics solutions, from the freeway to the front door. But first, we connect trucks with the outside world. Today, nearly every new truck in Europe and the United States is part of the internet. 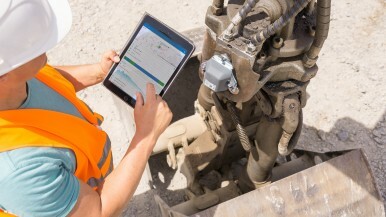 In this context, we supply truck manufacturers with telematics platforms that make things such as software updates or predictive diagnostics possible. All in all, our sales of connectivity control units for trucks are growing by 15 to 20 percent annually. 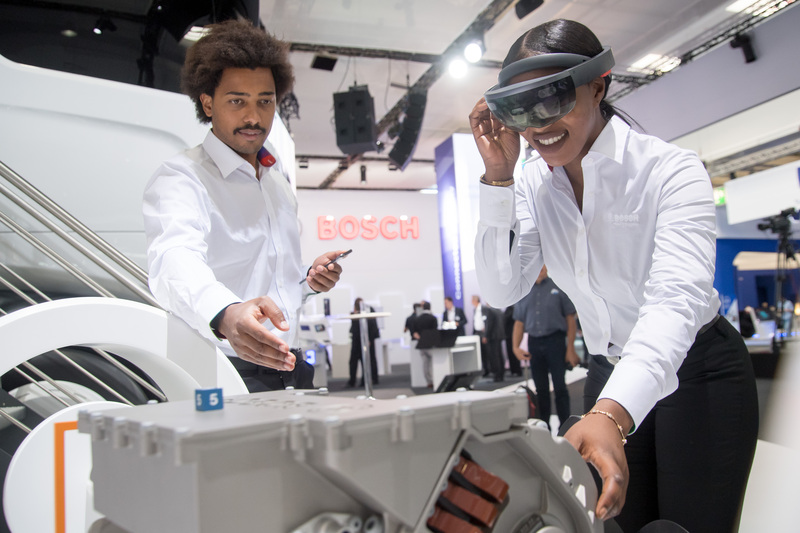 By means of connected driving, ladies and gentlemen, Bosch is also moving directly into the business of connected services. And it is this business that is taking us beyond our role as a supplier to the commercial-vehicle industry. Even now, our service centers are monitoring the condition of especially critical deliveries of goods around the clock. In some cases, these are vital goods such as blood plasma. Every year, our control centers monitor nearly 40,000 high-value truck loads in transit. In addition, we are expanding our platform that provides secure truck parking along freeways. The Hamburg cruise terminal is the latest example of this. From next month, we will be offering long-haul trucks secure parking spaces there. This service is also intended for truck drivers waiting for their handling slot at one of the container terminals. The internet of things can not only make freight transport more secure than ever – it can also make it even more efficient. If we consider that nearly every fifth truck journey is unladen, there is clearly a lot of potential to be exploited here. Moreover, Bosch is helping to create clarity in what was previously a logistical blind spot. Using the internet of things, we are automating delivery tracking by making a digital track and trace function possible. Our solution uses sensors on goods and containers that transfer information about position, temperature, and vibration to the cloud. Where is the transport container, and how are the goods doing? Finding answers to these questions used to take several hours: now they can be found in a matter of seconds. Initial experience in the field shows that the real-time logistics solutions we offer mean that dispatchers can cut their search and inventory effort by more than half. Moreover, the availability of reusable containers is increased by as much as 30 percent. We call this logistics 4.0. This final point is a perfect illustration of the path Bosch wants to take in the logistics industry. Electrifying and automating trucks is one part of the story. Connectivity also contributes to this, but it can also increase the productivity of road freight as a whole. We are using the internet to reduce the burden on the road network. There is no doubt that more and more goods need to be transported. Bosch solutions are helping to ensure that this demand does not come up against the limits to growth.